As regular readers will remember, I posted my blog a little bit early last week – Christmas Eve, which was Wednesday. Earlier that day I had visited Pine Street Inn to distribute food to residents there. 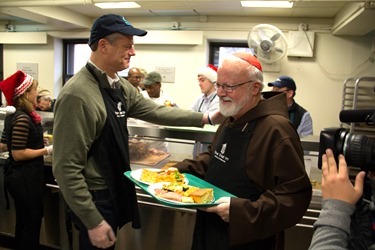 I was joined by Governor-elect Charlie Baker; Lieutenant Governor-elect Karen Polito; Msgr. 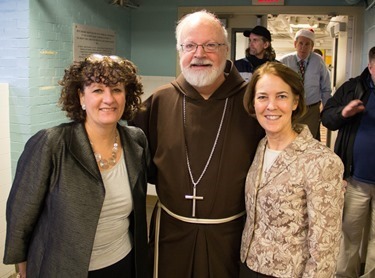 Frank Kelly, who was very instrumental in founding Pine Street Inn and is still very much involved there; and Lisa Alberghini from our Planning Office for Urban Affairs, who also works very closely with Pine Street Inn. 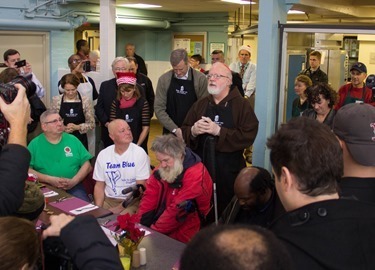 I began my visit saying a prayer with those at the shelter, and distributing meals to them. I had a chance to visit with a number of them. In addition to the residents, it is always edifying to meet the volunteers, many of whom have been going there for many years. Some of them now even bring their children or grandchildren. 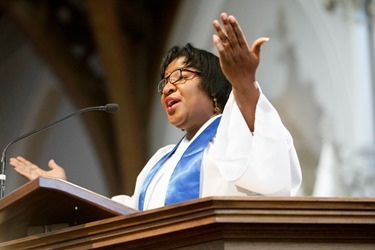 There is a beautiful tradition of people who volunteer and support the work of Pine Street. 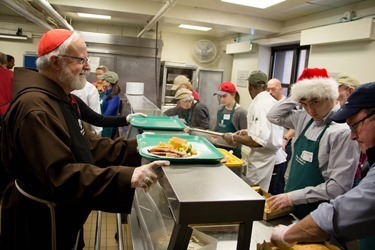 They had large crowds this year and, of course, with the closing of the city-run Long Island shelter the private shelters have had to accommodate even more people than they usually do. I am always so impressed by the fine work that Lyndia Downie, the director Pine Street, is doing and I’m happy to help draw attention to the terrible problem of homelessness in our society. Beyond the shelters here in the city, there are hundreds of families who are being warehoused in motels around the state, which is not a real solution to their situation. It is not uncommon for homelessness to be related to the problem of mental illness. As a community, we need to do much more to help people with the challenges of mental illness. So often, that population ends up on the street. 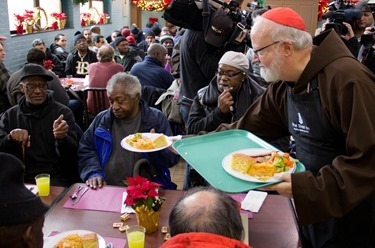 It is my hope that by visiting places like Pine Street, I can raise consciousness of need to do more to address the needs of the homeless and mentally ill.
That night, of course was the Midnight Mass at the Cathedral. 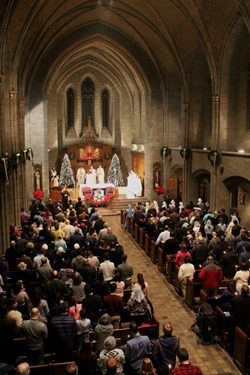 I was so gratified to see the Cathedral full of people. 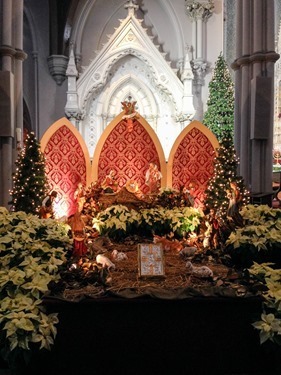 It was a very beautiful celebration made particularly so by the excellent job of cleaning and decorating the church done by Father O’Leary and his entire team of helpers. On Christmas morning, we had the televised Mass with the Daughters of St. Paul singing Christmas carols so beautifully for us. 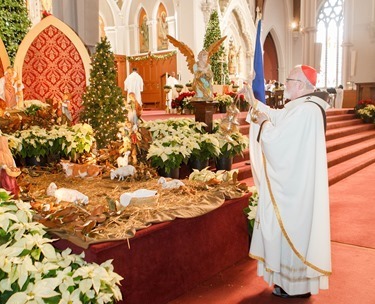 In this Year of Consecrated Life, which is also the centennial anniversary of the Pauline family, it was a particular joy to have the Daughters of St. Paul so generously be a part of that Christmas television Mass. 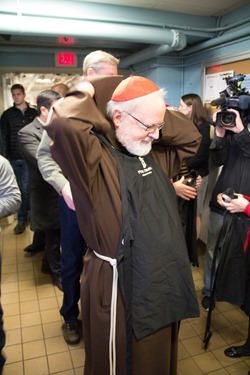 Later that morning I made my annual visit to St. Francis House. There we had a Liturgy of the Word with the residents. 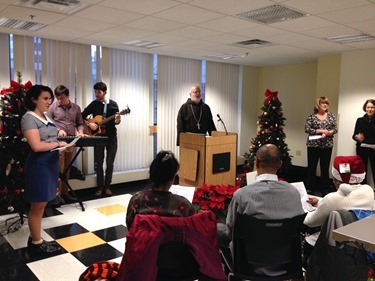 It was a particular treat to have the niece and nephews of Father Bob Kickham there to lead the music for us. 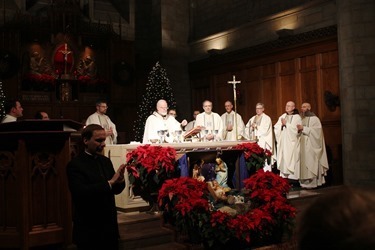 In my homily, I offered a reflection on the message of Christmas and the homelessness of the Holy Family at Bethlehem. We are working in conjunction with the Planning Office for Urban Affairs in trying to expand the capabilities of St. Francis house. 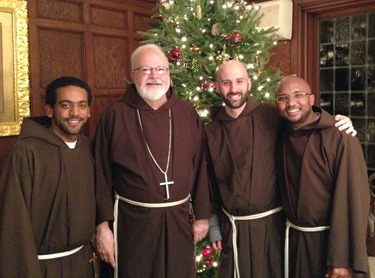 On Tuesday, I was visited by Brother Diogo, Brother Francisco and Brother Renaldo. Two of them come from the Dominican Republic and the other is Brazilian and they are all at Capuchin College in Washington D.C. They were here in Boston visiting relatives, and they stopped by the Cathedral for dinner. 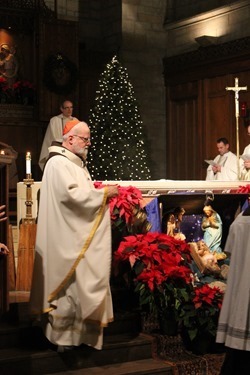 On New Year’s Eve I went to celebrate Mass at St. Clement’s Shrine in the Back Bay. 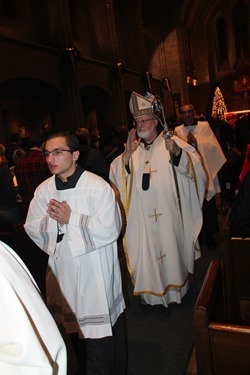 We have held this Mass with the pro-life and young adult communities at a number of different locations over the years. For the last couple of years it had been at St. Leonard’s in the North End, but we thought the shrine would be a good place to hold it this year. We began with a holy hour and, as we prayed the rosary, Father Peter Grover gave beautiful reflections on the Luminous Mysteries. Afterwards, we celebrated the Mass. 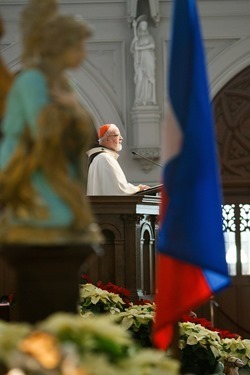 Following the Mass there was a nice reception with the people. 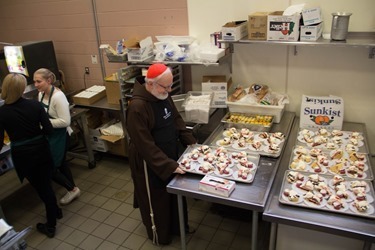 We are so grateful to Father Matt Williams and Marianne Luthin for helping organize the evening and make it a success. 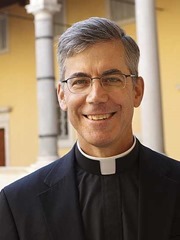 On New Year’s Day, the papal nuncio to Ireland, Archbishop Charles Brown, stopped by for a visit. He has relatives here in Boston, and came by to say hello. 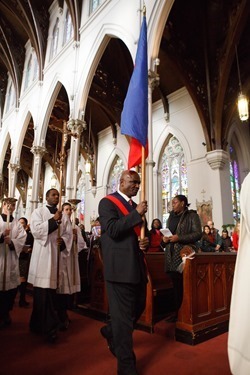 At noon I celebrated Mass at the Cathedral with the Haitian community, because Jan. 1 is also Haitian Independence Day. Once again the Cathedral was almost entirely full. A large number of Haitian priests and deacons were there with us for the Mass. 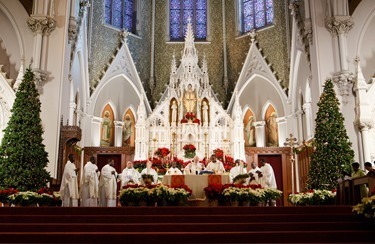 One of my favorite aspects of this Mass is that they always end it singing the Te Deum, which is a hymn of thanksgiving and singing it is a beautiful New Year’s custom in Europe and Latin America. 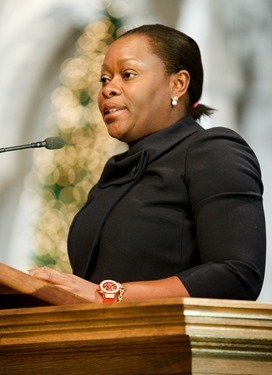 Before the final procession, Marjorie Alexandre Brunache, the Consul General of Haiti in Boston spoke to the people, as well. 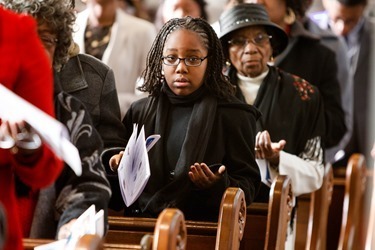 Of course, the Mass takes on particular significance this year as we prepare to mark the 5th anniversary of the 2010 earthquake that devastated Haiti. The Holy Father has called for a conference on the anniversary in Rome. Unfortunately, it is the same day as our ordinations of transitional deacons here in the archdiocese, so I will be unable to attend. However I have asked Bishop Guy Sanserique to represent me. 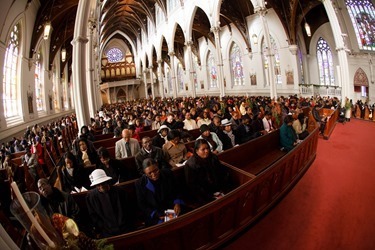 Bishop Sanserique is the only Haitian Bishop in the United States. 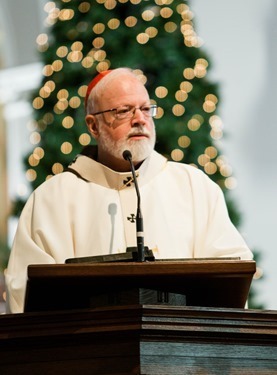 He is now a retired Auxiliary Bishop of Brooklyn, but he was very helpful to me when I was starting the Haitian apostolate in Washington D.C. 40 years ago. Let us keep the nation of Haiti and the Haitian people in our prayers, particularly in this time.